With the case and chain made of alloy, the quartz pocket watch looks fashionable and classic. 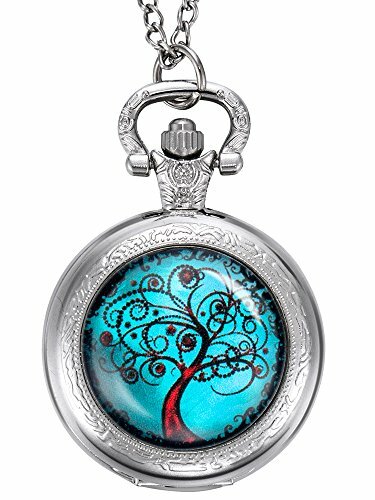 Spiritual and ancient life tree symbolizes growth, strength, and connection to all living things. Show the life tree symbol in your home as a sign that you are strong, you are unique, you are made from the stars and cosmos. The silver pocket watch is useful to see the time. It is a good gift to send to family members and friends for birthday, wedding, graduation and so on and it matches both formal and casual outfits. This pocket watch is not water resistance. Please take it off before shower and swimming.